Why Invest In Art Now? Between markets in flux and Brexit, investors are looking for alternate ways to invest in tangible assets that don't rely on the government. The growing trend in high net worth investing is to seek out asset classes with scarcity, like fine wines, antique cars, and real estate. However, in today's global market the real question is: Is art investment the next move? Arthena's Founder, Madelaine D'Angelo, breaks down the art market, art investment opportunities, and why to invest in a fund right now. The art market rebounded quickly after the last recession, faster than traditional investments. High net worth individuals (HNWI) with a portfolio diversified into art assets were not as greatly affected. Additionally, rather than investing in stocks or bonds, art provides investors with an alternative, tangible opportunity. 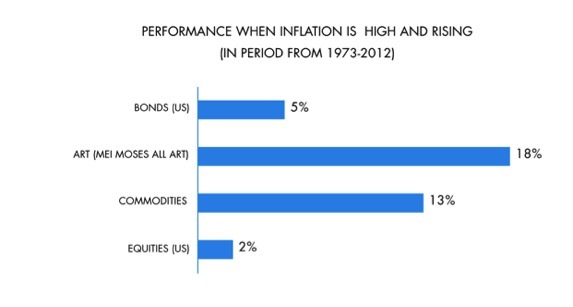 In times of high and rising inflation, art has performed historically well across all market sectors. Typically when there is an uncertain market, collectors look to purchase art with an investment view, not just to purchase beautiful objects. 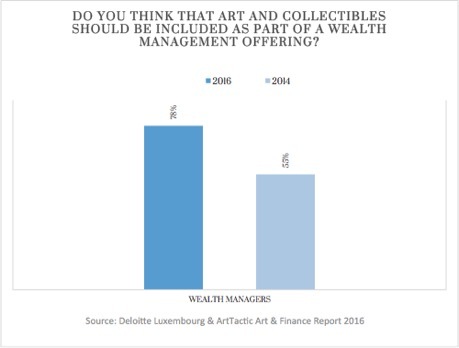 According to the Deloitte Luxembourg & ArtTactic Art & Finance Report 2016, 73% of wealth managers in 2016 (up from 58% in 2014) said their clients wanted to include art and other collectible assets in their wealth reports, in order to have a consolidated view of their wealth. 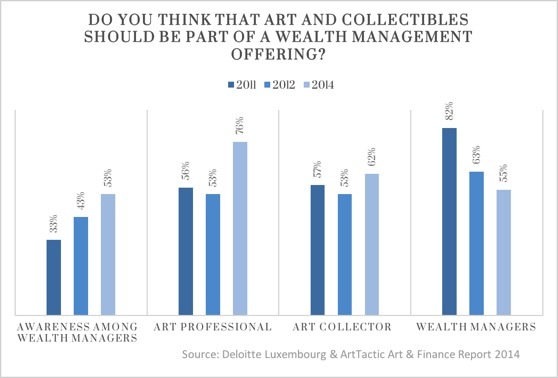 Also, in the 2016 report, 78% of wealth managers (up from 55% in 2014) said that they thought art and collectibles should be included as part of a wealth management offering. Modern portfolio strategy dictates that investors should have 5-7% of their portfolios diversified into the art market. The low correlation of art to equities & traditional asset classes provides valuable portfolio diversification, which leads to an increase in overall returns. According to the 2016 Deloitte Art & Finance Report, 72% of art collectors said they bought art for passion with an investment view. Further, there was an increase from 3% in 2014 to 6% in 2016 of clients and advisors looking to buy art specifically for investment purposes. What better time than to invest in alternative assets than now? It is a tangible, beautiful work of art in which value will remain if the price dips. There is a prestige associated with art that will never change, even if the value changes. Why it's the right time to invest in a fund ? Despite all of the compelling data on the art market, it is not a venture to be entered into without careful consideration and deep expertise. Through art funds, investors have the ability to quickly and securely tap into expertise and research that would otherwise take decades to cultivate. Art funds allow for a combination of art & financial expertise with a large capital base and exceptional advisors. You, as the investor, purchase shares in a fund and art experts invest in works of art that reflect positive trends in the market so that you don't have to risk purchasing work that won't provide a return. Unlike dealers who hold onto artworks for short periods time for quick turnarounds, the "buy & hold" strategy allows for work to appreciate in value so that art advisors can place the work on the market at the right time. Artwork is traded infrequently due to the November-May auction schedule, which is why it is important for art experts to use market analytics to find the best time to sell. Most transactions come through private sales, not gallery sales or through the secondary market. This allows the investor to free up time and cash reserves to take advantage of opportunities in the market without worrying about their art investment. Also, the large variety of categories in funds allow for various ranges in investment, from higher risk opportunity funds with emerging artist's work to lower risk traditional funds with blue-chip Modern artwork. You need access to find the right opportunities, so investment funds are the perfect entry-way to begin your art investment history. Investment funds, like Arthena, provide access to new investors with an affordable minimum buy-in, especially when compared to other funds and online art marketplaces. Investors can diversify their portfolio without the worry that their investment will fail to yield a return, and partake in investing in a booming asset class. To learn more about art investment, sign-up for Arthena's Art Investment 101 newsletter series. Want to make smarter art investments? Visit our platform. Follow Arthena on Instagram and Twitter, like us on Facebook.